I was inspired to make biscotti from a friend who enjoys baking biscotti on his weekends. I have made biscotti many times, with many variations on flavour and consistency of the biscotti dough. For instance there are firm doughs, soft doughs and doughs that are so soft and airy that you need to pipe them through a piping bag. Anyways, for my experiment, I decided to pack as many ingredients and flavours into my biscotti that I had around the house. I did ended up with a biscotti that was jam packed fruits and nuts. I myself am personally a minimalist when it comes to flavours, but the biscotti seemed to hail good response from the party in which I brought these to. 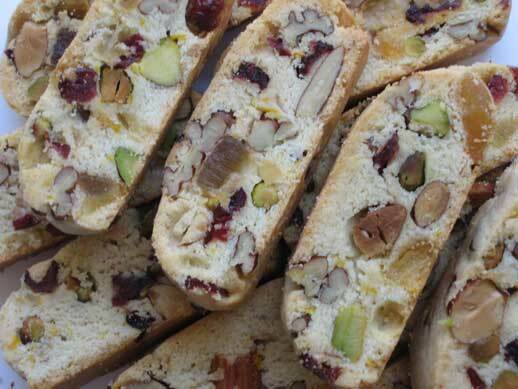 The high density of fruits and nuts make these biscotti a little finicky to cut. They are also not as crisp and crunchy as your regular biscotti as they have a higher ratio of filling to dough. 9. dry out biscotti for 5-10 minutes at 300°F on each side for your desired crunchiness. Posted by Sam at 11:42 a.m. I always use cranberries, 1 tsp.almond extract and vanilla extract, and 2 tsp. cinnamon. Maybe a dip in white chocolate on one side! It's a x-mas staple in my house and goes great with nog, brandy, and even sweet dessert wines! I love how you packed all those ingredients in. And I'm so glad to see you blogging! Thanks for your tips and for visiting.